Buy Wholesale pepper sprays and more now available. I get my pepper sprays direct from the factory. If you are interested in re-selling a great product including stun guns and personal protection items, just send me your name, address, and copy of your resale tax certificate(from your state). I will send you a a wholesale price list. First order minimum is $200 with a $100 minimum thereafter. Shipping must be by UPS ground service only. There is no expedited shipping available for pepper spray. Check the UPS site for delivery time between your zip code and ours (38305). The field of personal protection, both for police use and civilian use, has been an evolving field for some time and it continues to change every year. One of the options for personal protection that continues to dominate the market is pepper spray. It is widely used by police and civilians as an easy to use non-lethal way to discourage an attacker. For the police department, Re-Seller, Fundraiser, or military organizations using large amounts of this self-defense tactic, we offer a selection of wholesale pepper spray. Buying wholesale pepper spray can reduce the costs especially when doing regular training exercises with this weapon to familiarize new recruits. 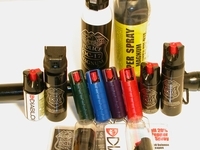 We offer powerful wholesale pepper spray in a variety of options to meet your needs. Shipped in typical orders of 48 units per order, these powerful pepper sprays can spray up to 10 feet away for ultimate protection. Offered in different sizes and styles from 2 oz. perfect for pockets to 4 oz. ideal for belt clips and in both spray can and key chain form, wholesale pepper spray offers the best in powerful self-defense without the high retail cost of outfitting your entire team or force on an individual basis. All of the products we offer in this collection deliver a steady stream of painful pepper spray to stun any assailant into submission quickly. We offer same day shipping on this item so you can get what you need to get the job done even faster. Our fast shipping and budget-friendly prices make this line of self-defense an easy solution for any task force or organization. They also make good gifts for the entire family to teach them about their right to personal safety! For over a decade and a half, DefenseDevices.com has been proud to serve you for all your personal safety needs. Whether looking for pepper spray in bulk or a compact stun gun, our carefully chosen inventory has something to keep you safe and secure with ease. We would be happy to answer any questions you may have about any of the options we offer and look forward to being a part of your safety plan! We offer the best values in self defense products, non lethal weapons like pepper spray, stun guns, batons, personal alarms as well as home security alarms and child safety products.